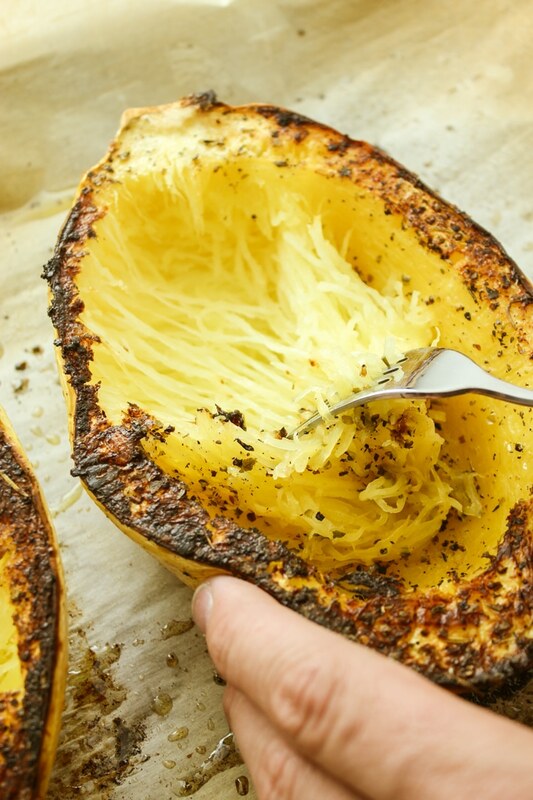 Here’s the thing with spaghetti squash – it can take a long time to cook. And as such, I don’t see the merit in waiting an hour-ish for the squash to cook, only to turn it into a casserole or a bake or waffles or a quiche crust. Ain’t nobody got time for that. 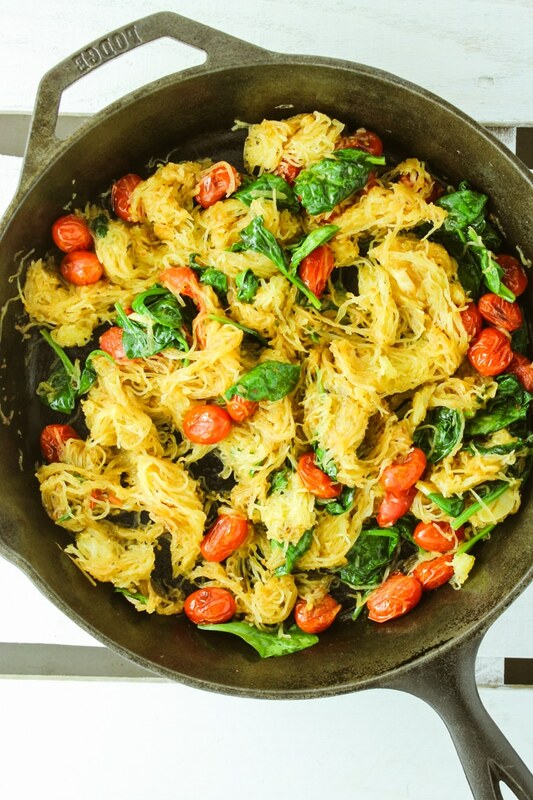 The beauty of spaghetti squash – in my opinion – lies in its simplicity. It is what it is. And what it is – is a beautiful squash with a personality all its own. Buttery and mildly sweet, with a texture that’s similar to crunchy, skinnier zucchini noodles. My philosophy is this: keep it simple. And that’s exactly what we’re going to do with this spaghetti squash. 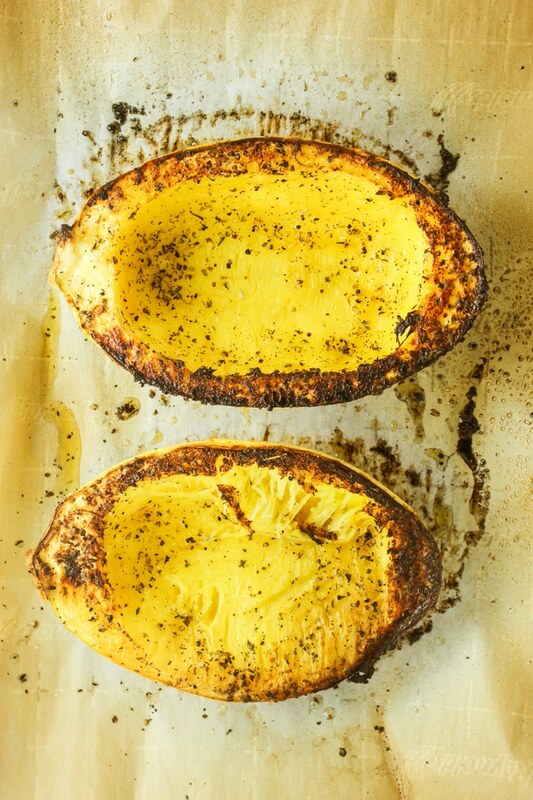  First, it goes into the oven for a quick 35-40 minute bake (depending on the size of your squash). 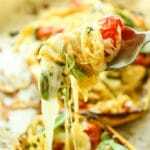 Then you scrape out the “spaghetti” and toss it in a skillet with golden-brown garlic, burst tomatoes, and spinach and scoop everything back into the hollowed halves. A sprinkle of cheese, salt, and pepper and it’s back to the oven to get melty and crispy. 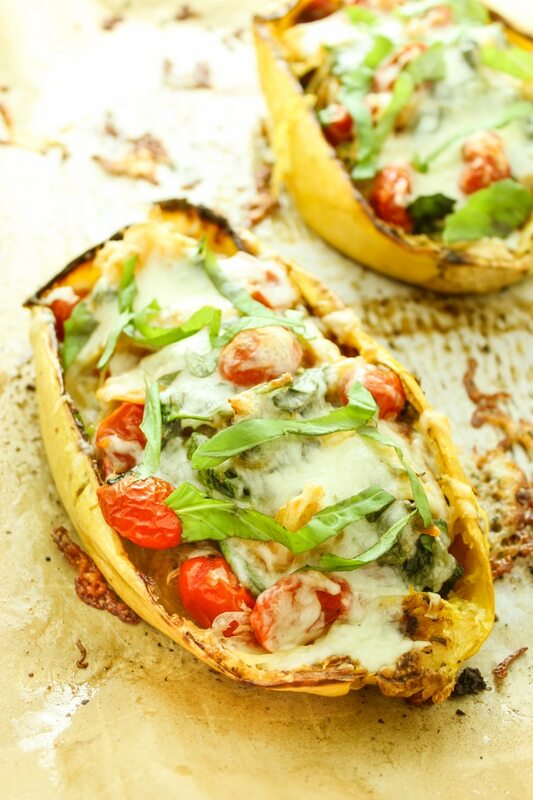 I think it’s cute + functional to serve this meal right inside the spaghetti squash halves. It’s like food that comes with its own bowl.  Does it get any better than that? This is the kind of meal that’s perfect for Saturday night. This served both of us as a main dish, but again – that all depends on how big of a squash you get. I prefer to buy them smaller because they roast faster… and perfectly serve the two of us with no leftovers. If you’re clever, you could double this recipe and heat up remaining halves for lunch throughout the week! 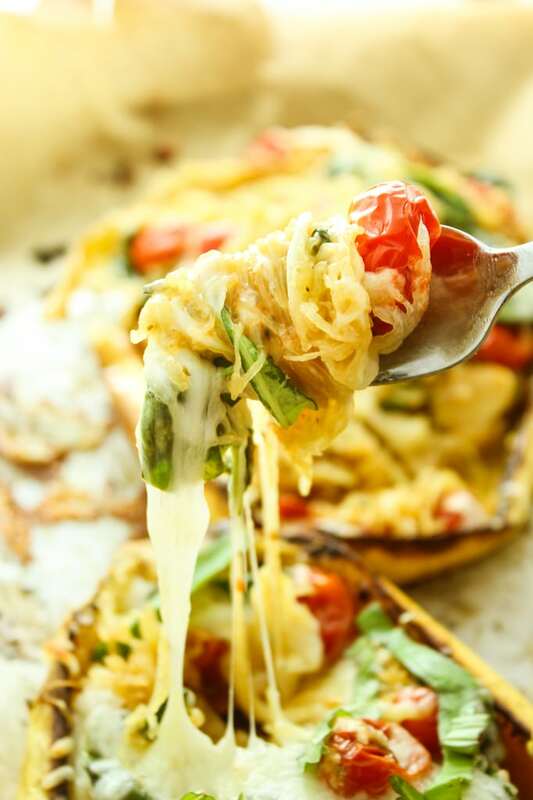 This easy, twice-baked spaghetti squash is stuffed with sautéed garlic, tomatoes, spinach, and melty, golden brown cheese. Preheat oven to 400º and line a baking sheet with parchment or foil. 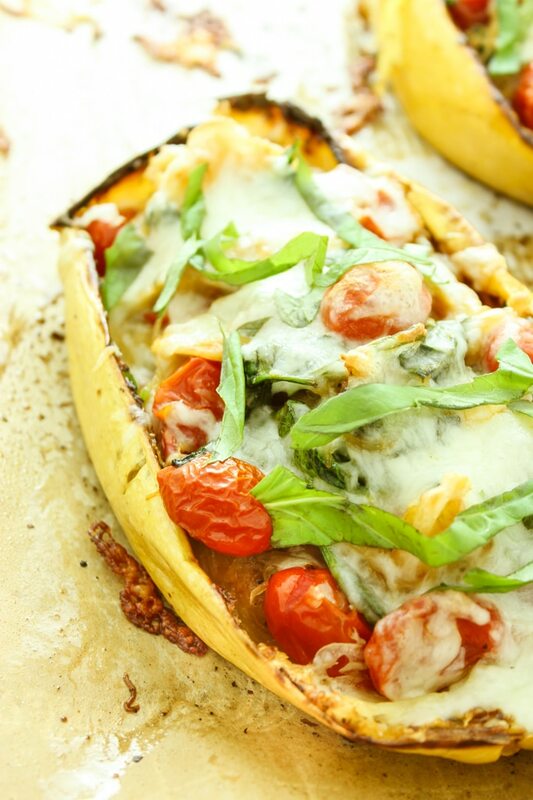 Chop spaghetti squash in half vertically, from end to end. 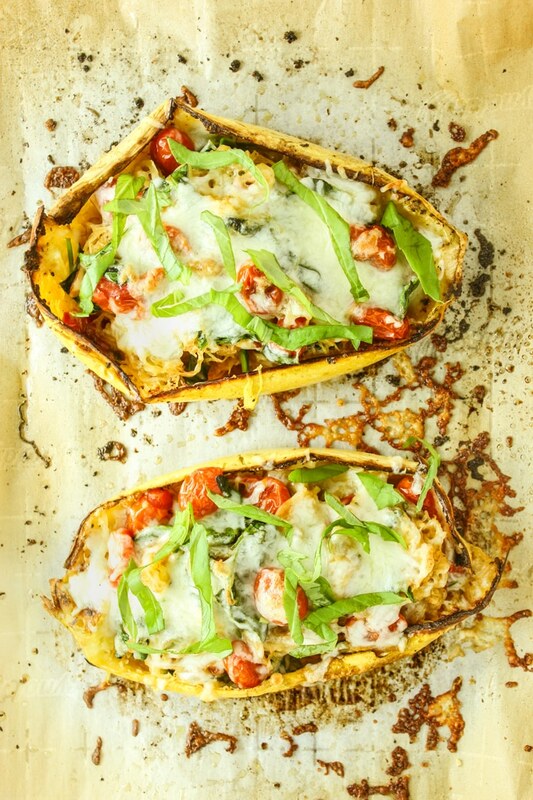 Place spaghetti squash halves on baking sheet and drizzle with oil – about 1 tablespoon each. Sprinkle with salt, pepper, and italian blend. Place squash cut sides down on the baking sheet and transfer to the oven. Bake 35 minutes. Remove squash from the oven, flip the halves over, and allow to cool. Seriously. Allow to cool. Use a fork to scrape out the “spaghetti” from each half. Set aside. 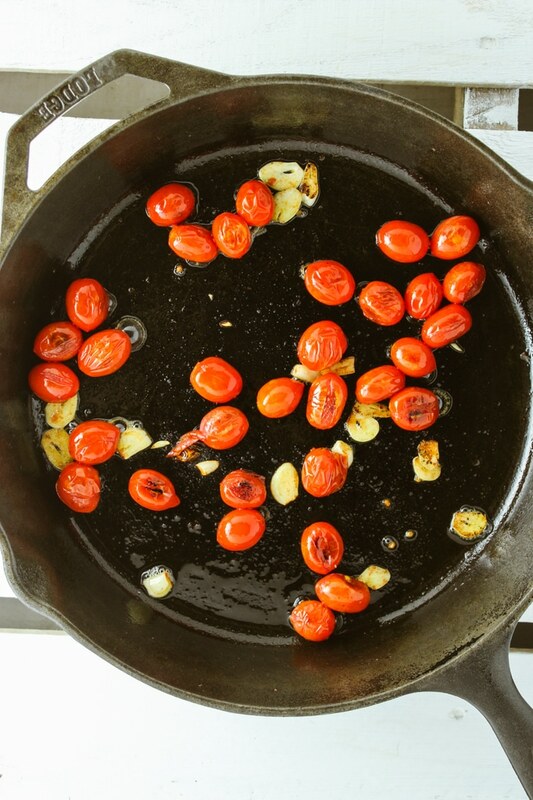 In a large skillet or pot, heat 3 tablespoons of oil over low. Add tomatoes and saute for 10 minutes, until they soften and start to burst. Add garlic and saute 3 minutes. Then add spinach and spaghetti squash. Toss to combine. Continue cooking for 6-8 minutes, until spinach is wilted. Scoop the mixture back into the hollowed squash halves and top with cheese. Return to oven and bake 8-10 minutes, until cheese is melted. Remove from oven. Eat directly from the squash halves or plate it up! Garnish with fresh basil and parmesan, if desired. That’s awesome! I’m so glad you liked it. :) Thanks for letting us know! Awesome! I’m so glad you liked this!